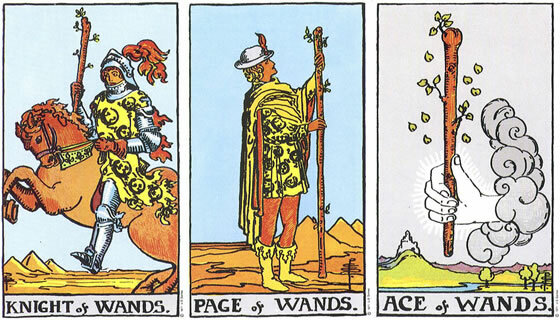 The Rider-Waite-Smith Tarot - Knight of Wands, Page of Wands, Ace of Wands. Wands are enthusiasm, motivation and inspiration. They represent the active energy and busy-ness of life. The wands are fire, associated with the energy, drive and determination of actively engaging in your passions and desires. Whereas Pentacles/coins are the work and rewards of life and of business, wands are the active energy that propels us forward and keeps us motivated, directing our energy towards goals. You may have been going in one direction for some time, aiming and charging forward towards a goal with real determination as if you're on a mission with focused intentions, but this week you could see that direction change. A new inspiration or new information can have you choosing a new direction and new beginning, or at least a new perspective. There is a young, beginners type of energy here. Start again. Start new. Start fresh. Being like a kid again, with great imagination, curiosity and zest for new, creative experiences can open you up to new possibilities. This can also represent changing your energy from being on a mission, to one that is more like playing a game or a performance. It has been said that the world is a stage. Making it about having fun, and a little less serious can help you change it up to something new. This is especially helpful for those that have felt they've been heading in a certain direction for some time and need a refreshing change. Clearing up the energy in your life with a fresh, alive, inspired, positive approach is suggested. Ask, what NEW direction could I start on today? Add something different to your life that inspires you to create new goals. Bullying is also referenced here, so if that type of energy is around you, a change toward humorous, fun, happy-go-lucky energy can help clear things up. Entertainments can help you feel more inspired. If you are a writer, this can indicate changing up your style and adding a different flavor or variety to your skills. Perhaps if you usually write prose, you could try poetry for a change of pace. For those of you that are into sports or performance, this could indicate trying different techniques other than the ones you're used to charging forward with. If you are a parent this could indicate changing your approach to parenting, especially if you are finding yourself dealing with a bit of a rebel. You may need to have a talk and create a new shift in priorities. For those of you that watch the dramatically high energy, sensationalist news, perhaps it's time to consider how information affects your life and perspective, and do a clean up of the info and entertainment that comes your way. Focus on creating new, positive vibes! 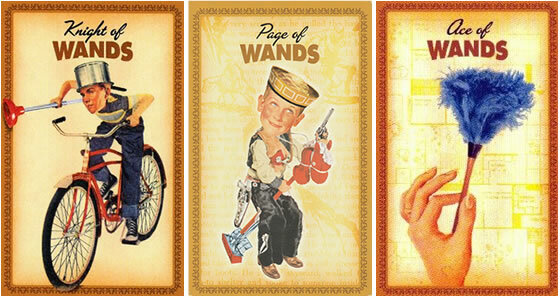 The Housewives Tarot - Knight of Wands, Page of Wands, Ace of Wands.